…place where the tomb and the mausoleum of Mughal emperor Humayun, are situated – PHOTO: KRISTIAN BERTEL. The tomb and the mausoleum are located at Mathura Road, near its crossing with Lodi Road – and respresent the first significant model of Mughal architecture in India. 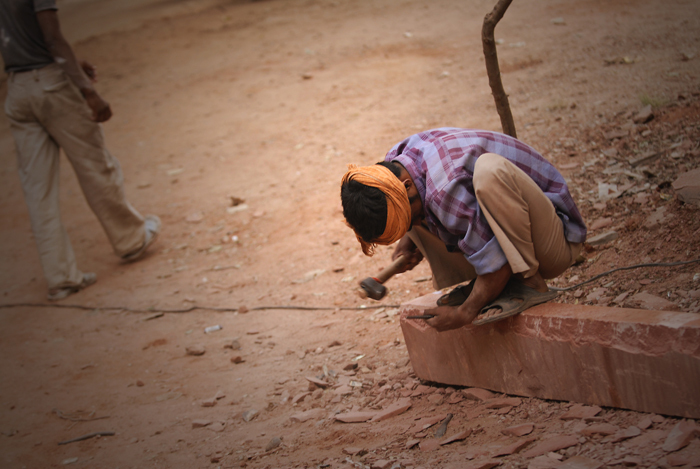 An Indian man cutting stone at the Humayun’s Tomb, New Delhi. The photographs from India are displayed in series of more than 400 images in sceneries from small villages to larger cities. The photos are ranging from majestic landscapes and cityscapes to intimate portraits, and each picture convey a story in the photograph. With a focus on humanity and diversity the aim of his documentary photography is to describe these topics in mainly people and landscapes.